Villanova Business School Dean Joyce Russell in the atrium of Bartley Hall. 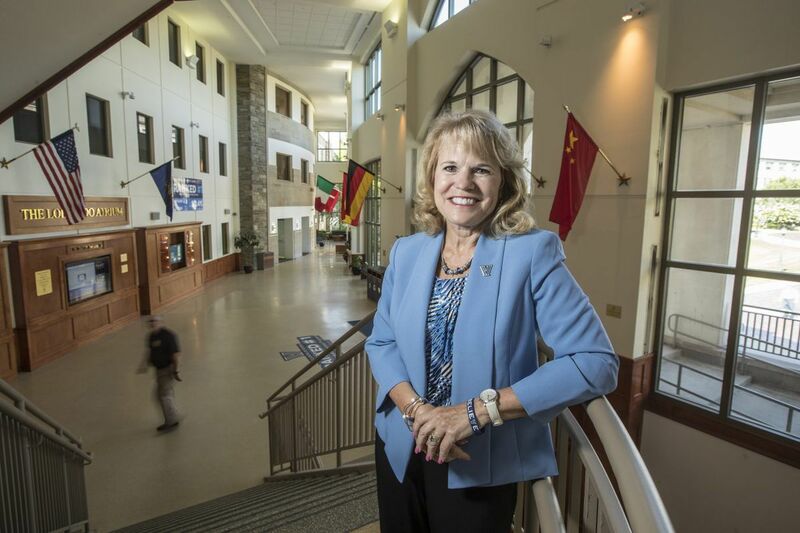 It was just over a year ago that Joyce Russell, longtime senior associate dean and vice dean of the University of Maryland's Smith Business School, took over as the dean of Villanova's B-school. What surprised you — at Villanova, and in Philadelphia? One thing that people told me when I came here is that the alums are zealots, and they are. I was at Maryland for a long time and I love the school, but there's no comparison in terms of the alums. I think the size is a factor, 11,000 [enrolled at Villanova] vs. 40,000 [at Maryland]. And I have to say, after meeting these undergrads, they're smart, they work incredibly hard. But the thing I love about them is they're happy and well-adjusted. They're always smiling. And they're mission-based. What can I contribute to the world? How friendly the people are. I say that because my husband is from North Carolina, so when he came here, he was moving into even more Yankee territory, up from Maryland. And he even said, how, just out and about, in the stores, people are super friendly, so that's been a pleasant surprise. What’s trending in business school? Business analytics. Anything with data. I walked into a great situation. We already had a center for business analytics. Our undergrads all take analytics. That's really hot. When I talk to prospective students, they'll say, "I'm going to major in finance and analytics, accounting and analytics, marketing and analytics." They know that no matter what they end up doing, they need to have analytics. One area I want us to move more in, in the business school, is cybersecurity. It's in computer science and engineering, but not necessarily in business. When you talk to CEOs, that's their number-one stressor: What's going to happen with data and breaches of security. We're also trying to do more partnerships with the rest of campus — arts and sciences, engineering, nursing — because so many students want business skills. You’ve taught leadership and you’ve coached executives. What is Leadership 101 for them? You can always ask: Has anyone ever worked for a bad boss and, like, three-quarters of the people raise their hands. As an executive coach, we talk a lot about emotional intelligence. I spend a lot of time on people understanding themselves. You should know what your potential strengths and derailers are, the things that can get you into trouble. And so, bad bosses often don't have any self-awareness, or they don't manage their derailers. You have to do enough assessments to figure out what you are like, and figuring out the triggers that cause problems, and then practicing and getting feedback. You have to trust people, like, "I'm going to be working on trying to be more empathetic. Give me feedback on how that's working out." What if you were coaching yourself? I try to make sure that we focus on the group, as opposed to self. With a dean, people say, "OK, tell us the answers." But that's not how to build a culture. In a job like this, you can start believing the hype about yourself, and that's one of the biggest problems for most CEOs. I told a friend of mine, "Look, if I start believing that hype, then just slap me around." I'm pretty organized, so you always want to make sure you're not imposing your strategy on other people. When you are interviewing people, what qualities do you think are important? Integrity. And the two things I care about, besides [the ability to perform the work] are confidentiality, because you're going to hear a lot of things about a lot of people, and you can never reveal those things, and professionalism. It encompasses work ethic, initiative, and then how you treat people, every single person, like every person matters. That's really important and goes back to good bosses, bad bosses. I hate favoritism. I hate rankism. Treat every person that walks in like they're the same as some other person who walks in. Family: Bryan Anderson, husband; daughter, Julia Anderson, 16. Diplomas: Doctoral and master's degrees in industrial and organizational psychology, University of Akron; bachelor's, Loyola University. Resume: Prior post, senior associate dean, University of Maryland's Smith Business School. Earlier, management professor at the University of Tennessee. Enrollment: 1,700 undergrad; 1,000 graduate. 7,000 applicants for 400 freshmen slots. Bragging rights: Undergrad business program ranked number one nationally by Bloomberg Businessweek. Majors include: Accounting, business analytics, marketing, management, economics, international business. Undergrad tuition a year: $50,554, plus fees. Interesting graduate program: Master of science in church management.